I seem to be getting an increasing number of emails from people considering moving to Alaska who want information from a person who actually lives here. Below are answers I've sent. If you have a question not addressed on this FAQ, you may either post a comment/question to my Living in or moving to Alaska FAQ blog, or post a question or email me at my facebook page. Some of these questions are more specific to Juneau, as I have been living here since 1999, but I lived in Anchorage from 1988-98 so I can speak to a lot of issues about living in South Central Alaska as well. Also, I have visited many different communities in Alaska. Fairbanks is extremely different from either Juneau or Anchorage, and villages like Kake and Angoon are even more different. You know how every now and then you have these guys like Timothy Treadwell who live off the land in Alaska. How do they do this without getting into trouble? Is it true that the government subsidizes the income for each family member at $900.00 per person? How does this work? How long each year is it dark ALL the time, how long is it light? Is it possible to raise crops in Alaska? I've read about certain regions producing huge vegetables; doesn't the short growing seasons limit agricultural productivity? Is the cost of living really that much higher? Are there ample jobs in Alaska? I'm a (nurse, teacher, fisherman, insert job here) are there many jobs for me in Alaska? Since Juneau doesn't have incoming/outgoing roads, would bringing a car be worth it? What is the best ferry route to Juneau when bringing a vehicle? Is a 4-wheel drive car or truck mandatory for Alaska? Have you ever driven to Alaska from the Lower 48 on the ALCAN Highway? Is it as dangerous as I've heard? Is it a bad idea to try to move to Alaska in the middle of winter? I'm bringing money to last a couple weeks while I find an apt. and job; is that realistic? My husband and I are on social security...is there much "hassle" with something like that out there and do they have such a thing as "low income housing" in Alaska? Can a vegetarian survive in Alaska? Your website is almost entirely about the bigger cities; what is the character of the small interior towns and the people who live there? I saw you graduated from the University of Alaska and was wondering if the teachers were as nice as the rest of the people there? Also, what was the University like? Was it fun? boring? did you like it, hate it, or what? Do you get that bored, small town feeling in Alaska? Is it true there is surfing in Alaska? What else is there to do in the Juneau area? I am still single, is there a good dating scene in Alaska? I've heard of the mosquitoes in Alaska, what other bugs do you have? Is Alaska more dangerous than the lower 48? Are things like wildlife, earthquakes, avalanches, etc. a real concern? What stores are there? Like malls, clothing stores, craft shops, wine and beer making supply stores, and supermarkets? I love to shop and was wondering about the difference in stores? I have a dog which is not at all an Alaskan-type dog. Would he be all right in Alaska, or would the environment be too harsh for him? He is always inside when I am home, but I do leave him out in the back yard when I'm at work. I am interested in immigrating to Alaska. Can you tell me a good place to start? Is it true that if you move into a remote area of Alaska, build a log cabin and live there for a year, the government will give you that piece of land? Hey, just wondering, is there a gay scene in AK? Are most Alaskans tolerant of homosexuality? My question is about diversity. I was wondering if you knew if the black people in Juneau are well received, if there are any issues? 1. Every now and then you have these guys like Timothy Treadwell who live off the land in Alaska. How do they do this without getting into trouble? Well, Timothy Treadwell and his girlfriend got eaten by a bear so I wouldn't really use them as a working example. Also, he worked for a bear protection foundation and they paid for him to have his supplies shipped into Katmai National Park so, he wasn't really living off the land either. If you look at someone like Chris McCandless, things didn't turn out so well for him either. He starved to death when he ate a poisonous plant that he'd misidentified from an edible food field guide. My honey's mom and step-dad live in Gustavus, a small secluded town near Glacier Bay National Park. Most people there live in cabins with wood stoves, minimal or no electricity, out houses, and they garden and hunt and fish etc. That way of life is hard hard work and yet they figure about half of their food still comes from a store. I think it's a nice fantasy for some people, I had that fantasy very strong as a young girl but I’ve been in Alaska for 20 years now (granted, not living in the Bush but getting out a lot) and I can honestly say I wouldn't be anywhere near able to subsist off the land. So, if you're really serious...look about buying a cabin in one of these small communities first. Land is relatively cheap and you can get a taste of it. If you don’t have the money to buy, try to make a contact in one and see about a cabin sitting situation. Try it out for awhile and see how you like it. I guess a lot of young people move to towns like Gustavus with dreams of living off the land and they almost never make it. Usually it's the loneliness as much as anything else that gets to them. Anyway, I would HIGHLY discourage just stocking up and going off into the wild without trying an intermediary step first. Trust me, people here die in the woods every year from lack of experience. I wouldn't want to see that happen to you! 2. Is it true that the government subsidizes the income for each family member at $900.00 per person? How does this work? What you're referring to is called the Alaska Permanent Fund Dividend. It is a fund the state of Alaska started with the revenue generated from taxes on oil sales. The dividend is paid to every Alaskan resident (man, woman, and child) and each year the value of the PFD check varies. In 2008 the checks were $3269.00 but only $2,069 of that was actual PFD money, the other $1,200 was a one-time "Alaska Resource Rebate", essentially money to help Alaskan's afford what was (at the time) the incredibly high oil and gas prices for heating their homes during the winter. 2014's amount was $1,884.00 but it has been as low as $386.15 in 1983. They have generally been over $900.00 dollars since 1990, although in 2013 the amount was exactly $900 even! The amount of the dividend is not determined by the price of oil, but by the "realized gains" of the fund, averaged out over 5 years. So, essentially the stock market has a bigger effect on dividend checks than the price of oil. There are residency requirements; I believe you have to live in Alaska for one year and then you can apply for a PFD the following year. The checks are auto deposited in people's accounts or mailed out, in the beginning of October, then you will see big PFD sales everywhere, as local businesses compete for the large influx of cash into the state. Parents can also elect to put a portion of their PFDs (or their children's entire PFDs) into college savings funds. It's an excellent program but each year legislators debate dipping into the PFD to pay for "essential" statewide services. It is considered political suicide to make this suggestion. However, since the state of Alaska does not have a statewide income tax (and some cities like the City and Borough of Anchorage don't have sales tax) there are years where budgets fall short. 3. How long each year is it dark ALL the time, how long is it light? 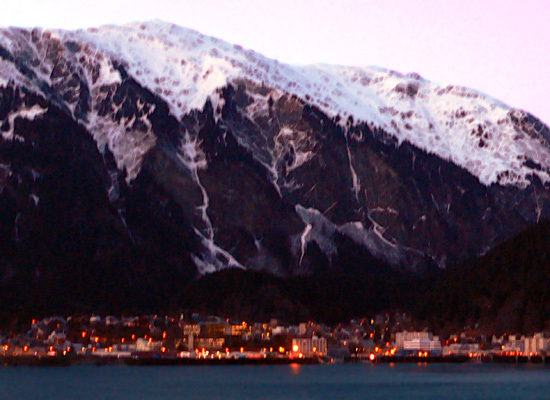 Daylight issues are much less of a consideration in Juneau than in other parts of the state. It seemed to bother me *much* worse in Anchorage than it does here, we don't ever have a time in Juneau where there is no sunlight at all, although it is a deciduous rain forest so there are plenty of overcast days which may make it seem darker than it really is. Even Anchorage gets a little over 5 hours of sunlight on the shortest day of the year. Plus, Anchorage is a lot sunnier (and colder) in the winter than Juneau. On the other hand, there isn't as much sunlight in the summer here in Juneau; even at the Summer Solstice we get several hours of dusky darkness in the evening. The earliest sunrise in Anchorage is around 4a.m. with the sun (kind of) setting at around midnight. 4. Is it possible to raise crops in Alaska? This depends a lot on where you live. There is a lot of agricultural developement in Palmer and the Mattanuska-Susitna Valley and other parts of the state. It's true that the growing season is short but the nearly 24 hours a day of sunlight accelerates growth. As for giant vegetables, they are not a myth. A good time to see them is at the Alaska State Fair. In Southeast Alaska where I currently live, we don't as much sunlight, and a lot more rain, so most people garden on mounds so that drainage isn't as much of a problem. There are community gardens all throughout Alaska and probably every different climate zone imaginable. I remember one time it was something like 34 degrees in Juneau, and -34 degrees in Barrow, so you get the picture. 5. Is the cost of living really that much higher? The cost of living difference between your current location and Juneau (or another Alaskan city) could be quite high or it could be about the same. Non-3-D evening movies in Juneau are $11:00 ($10.25 in Anchorage), a loaf of good bread like Oro Wheat is about $4.50, gas in Juneau is 3.75$ a gallon and is around 3.60$ a gallon in Anchorage. Housing in Juneau is still expensive, even with the turn down in the housing market. I bought a 1300 square foot house in downtown Douglas on a very small lot with no garage for $163,000 in 2001. I had it appraised in 2011 to refinance and it came in at $265,000. Rent in Juneau for a two bedroom apt. can be around 1100 bucks and up, around 850-900 for a one bedroom. Electricity/oil heating another 100 bucks a month (or more) but that has gone up quite a bit lately too. My annual oil bill last year was around $1,700 but if the price of oil stays low, it should only be about $900 this year. In April of 2008 an avalanche took out Juneau's hydro power so the electricity rates temporarily went up by more than 500%!! !, but barring natural disasters and provided there's enough water in the lake, Juneau's electricity is relatively cheap and clean. Villages in the Bush are another story, with rates that continue to be much higer than the national average. On the other hand, salaries tend to be higher in Alaska as well. Make sure that you determine the cost of living adjustment for Alaska by using a cost of living calculator. You can put in the calculator that you make 50 grand where you live now, and it might tell you that you'll need to make 70 grand in Juneau (for example) but figure that out so you can negotiate a fair salary. 6. Are there ample job opportunities? There are lots of jobs depending on where you live and what kinds of skills you have. In Juneau, for example, there are lots of state jobs because it's the state capitol. In the Anchorage area there are lots of jobs because it's the largest city in the state and also because Anchorage is positioned well between Asia, Europe, and the lower 48, in terms of shipping and manufacturing. The main industry is oil, after that is tourism, and then fishing. Jobs tend to pay more but the cost of living is higher too. 7. I'm a (nurse, teacher, fisherman, insert job here) are there many jobs for me in Alaska? I really have no idea if there are jobs in individual fields or not. Our economy at the moment isn't terrible, so I'm assuming there are jobs out there the same as anywhere else. I'd recommend checking the classified adds for the paper in the region of Alaska you're interested in moving to. The three main newspapers in the state are the Anchorage Daily News, Fairbanks Daily News-Miner, and the Juneau Empire. You may have to register to access them (which is free) but it will give you a good idea. Another great place to check is the Alaska Job Center Network or "match your skills, interests, and values to the world of work" through AKCIS, the Alaska Career Information System. 8. Since Juneau doesn't have incoming/outgoing roads, would bringing a car even be worth the effort? "Juneau residents are divided over whether to build a road to Skagway or improve Lynn Canal ferry service, according to a study released this week by the State Department of Transportation. Haines and Skagway overwhelmingly support improved ferry service, according to the poll conducted this summer by the Juneau-based McDowell Group. Thirty-six percent of Juneau residents prefer building a road up the east side of Lynn Canal to Skagway, while 36 percent support enhanced ferry service, the poll found." Anchorage has a pretty good public transportation system as well but it is even more spread out than Juneau. I lived in Anchorage for 3 years without a car and it's doable, but you have to be committed, particularly in the winter when it gets cooooold. If you fly into Alaska, there are plenty of places to buy new and used cars once you get here. 9. What is the best ferry route to Juneau when bringing a vehicle? There are a couple ferry routes that you could take to get to Juneau. There are stops out of Haines and Skagway, or you could take the ferry out of Bellingham WA, or Prince Rupert, BC. From Bellingham, (one way), an adult ticket is $326. A 15' car or truck is an extra $739. Getting a room is another $300, so it adds up. From Haines, (one way), an adult ticket is $37. A 15' car or truck is $75. And rooms are cheaper but it's not an overnight trip so you wouldn't really need one. (Fairs from Skagway are a little more expensive than from Haines). See the Alaska Marine Highway website to compare fares. The above is based on summer fares, not including meals. I'm not sure if the winter fares are cheaper but I know they don't run as often. 10. Is a 4-wheel drive car or truck mandatory for Alaska? That depends. Personally, I would highly recommend a 4-wheel drive vehicle for most parts of Alaska. The 4-wheel drive is currently broken on my car and I can't afford to get it fixed. Because of that, I have to take the bus a lot during the winter because the roads are too dangerous without it. Now, if you get special snow tires and feel comfortable driving in icy, snowy conditions, then you'll probably be OK.
Subarus and Honda CRVs (and similar) are very popular, as are SUVs. Manual transmission vehicles are also a lot more desirable here so it can be harder to find a used automatic vehicle in Juneau, though Anchorage has lots of car dealerships so you won't have to worry about that there. My friend who just moved to Juneau is having a hard time finding a used automatic transmission 4-wheel drive vehicle here in Juneau. She had a car accident her first week in Juneau and swears that the roads here are much worse than on the East Coast. It's probably true that snow removal, sanding, etc. takes longer here. Also, we almost never cancel work or school due to snow and ice. She also claims that car prices here are way higher. If you are trying to decide whether to bring your own car or buy one here, you might want to check with the local dealerships or the classified ads in the town you're moving to, to see which is more cost effective. But, if possible, I'd get a vehicle with 4 or all-wheel drive! 11. Have you ever driven to Alaska from the Lower 48 on the ALCAN Highway? Is it as dangerous as I've heard? The Alaska-Canadian Highway (AKA ALCAN) connects the contigious 48 states with Alaska through Canada. Although I haven't driven the entire thing, I have taken it from Anchorage to Haines when I was moving to Juneau. A rock flew in through the driver's side window of the U-Haul I was driving, spraying me with glass and it was really scary. My dad and sister drove the entire thing during the winter, and they ran into some really terrible weather. There are some pretty lonely stretches of road, so if you are going to attempt it, I suggest: go during the summer; don't travel alone; have your car completely checked out in advanced; stop for gas as often as possible; don't pick up hitch-hikers (and don't try to hitch-hike! ); have a current registration tags on your car, passport and driver's license (speeds up going through Canadian border) and don't bring any contraband; bring some camping gear, food, water, and basic tools in case you break down or get stuck somewhere remote. Cell phone coverage will be spotty. Bring a reliable map and do some research in advance. I suggest reading the short article Driving the Alaska Highway is Still a Great Adventure! or get one of the books on the highway, such as the 2014 book Budget Travel on the Alaska Marine Highway: A complete guide to vacationing along the Inside Passage. 12. Is it a bad idea to try to move to Alaska in the middle of winter? Personally, I think it all depends on where in Alaska you're planning to move. If you are considering Fairbanks, or even Anchorage...I'd probably say no because of many factors like low sunlight, dangerous roads, a lot of depressed and bitchy people, etc. Usually people are happy about the snow in the beginning of winter but start to get sick of it by Feb. so it depends what time of winter as well. Plus, think of having to unpack and cart all of your stuff into your new place with slush and mud everywhere. It depends on where you're moving *from* as well. If you're moving from somewhere warm like California, then, no regardless of the time of winter. Too much too soon. But if you're moving from somewhere cold, like Chicago, than it might not be as big of an adjustment. I guess it also depends on how much you like winters in general. Southeast Alaska (like Juneau for example) is another thing altogether. The winters here are fairly mild, with average temps around 30 degrees in the winter. I would recommend moving to Juneau in December before I'd recommend moving here in the fall, say, Sept or Oct (when it's raining and dreary everyday). My favorite time of year in Southcentral Alaska (from favorite to least favorite) is Spring, Summer, Fall, Winter. My favorite time of year in Juneau is Summer, Winter, Spring, Fall (in that order). As far as taking the Alcan Highway is concerned, I've never taken it except from Anchorage to Haines when first moving to Juneau. My dad and sister drove it up from Nebraska to Anchorage (in December) and said it got pretty hairy a few times because of snow storms and steep roads etc. I wouldn't recommend making that trip in the winter without a travel buddy or taking a lot of precautions (see #11). 13. I plan to bring enough money for a couple of weeks in order to find an apt. and job, is that realistic? The short answer here is no! I wouldn't move to Southeast or other parts of Alaska without a lead on a job. Anchorage is a larger city and you could probably find a job OK, depending on what field you're in. Still, if you're going to move this far, I'd come with enough money for first and last month's rent, groceries, gas, etc. Temporary housing is expensive, and you don't want to get stuck up here without a job and no money. It's harder to get back to the lower 48; a one-way flight from Anchorage to Seattle can be in excess of $400.00! 14. My husband and I are on social security...is there much "hassle" with something like that out there and do they have such a thing as "low income housing" in Alaska? We do have low income housing though I've heard (at the soup kitchen where I've started to work) that Alaska is a harsh place for people with low-income. What happens sometimes is people get up here, run out of money, and get stuck. As far as social security being a hassle here, probably no more so than anywhere else, especially if you're considering moving to one of our larger cities. As for low-income housing, you can contact someone from the Alaska Housing Finance Corporation. to see if you qualify and perhaps talk to someone from their office about your particular situation to see what their advice would be as I am in *no* way an expert. 15. Can a vegetarian survive in Alaska? Vegetarians are abundant in Alaska. I was one for 7 years when I lived in Anchorage and nearly everyone I knew were also veggies. I have lots of vegetarian friends in Juneau and we have a wonderful organic grocery store in town called Rainbow Foods. Lots of granola crunchers in Alaska and especially in Juneau, Homer, and Girdwood. Recently we joined a Community Supported Agriculture partnership here in Juneau with a place in Washington state called Full Circle Farms. All organic veggies for a really good price. If you move to Anchorage you can get hooked up with some Alaskan coops from farms in the Mat-Su Valley. My step-son is a vegan and he has absolutely no problem sticking to his diet here in Juneau. 16. Your website is almost entirely about the bigger cities; what is the character of the small interior towns and the people who live there? I wish I had more information about smaller communities in Alaska but I've never lived in one so I can't really say. I have spent considerable time in places like Seward, Homer, Eagle River, Whitter, Indian, and Kenai/Soldatna...as well as fewer visits to places like Telkeetna, Fairbanks, Denali, Valdez and Chitna and some very small bush communities but I've never *lived* in any of these places. All I can say is that Alaska in general is pretty conservative politically (a lot of Libertarians) and even more so in the smaller communities except for little pockets here and there. People are generally friendly and tend to be very self-sufficient but I suppose it would take you awhile to be accepted as a Sourdough...it is particularly difficult for Outsiders who come into tight-knit rural villages. I think it's because people don't tend to stay long. They come up to Alaska with a lot of romantic ideas and find the reality too harsh to deal with...no one wants to waste the time getting to know you if you're just going to uproot and leave in a year or two. But that is just my perception, and relates primarily to communities totally off the road system. Also, there are some odd characters up here, a high level of alcoholism and domestic abuse in part due to the isolation and lack of sunlight in the winter months, which last a long time. Plus, there are some areas that don't even have electricity or running water! I would reccommend visiting the state for one month in the summer and one in the middle of winter to get a better idea of which kind of community would suit you best. Talk to people in the bar, store, library, etc. and see what kind of vibe you get (plus, traveling around the state is gorgeous). Here are a couple sites where you can find out more on your own. The Statewide Library Electronic Doorway (SLED) has a wonderful page called Communities in Alaska and my library association's website has a section called Library Staff Describe Life in Alaska, with stories from some of the remoter villages. 17.I saw you graduated from the University of Alaska. What was it like? Was it fun or boring? Did you like it, hate it, or what? I started UAA (University of Alaska, Anchorage) in 1988 so I'm not sure how much the campus has changed since then. I have gone back and visited a couple of times and it seems pretty much the same. My experiences there were mixed. First of all, I lived off campus my first year, which made it difficult to meet new people. If you're just out of high school or a "traditional" aged student, I would highly recommend living in the dorms. Once I moved to the dorms I made a ton of close friends, many of whom I'm still close with today. My experience with the teachers was mostly great. The class sizes were small compared to many universities, and I had lots of help available. I was able to get a student (and later staff) position on campus which helped pay for school. After a year or two in the dorms my roommates and I moved into an apartment off campus and that was fun as well. We went to a lot of bars, dancing, to parties at friend's houses, and did a lot of camping on the weekends or we'd drive to little towns like Seward or Homer to get away for awhile. After that first horrible year (adjustment period) I ended up really loving Anchorage and UAA. Now I work for the University of Alaska Southeast and our campus is very different from UAA. The smaller campus size means smaller class sizes and the fact that most professors will know you by name. UAS is very laid-back and friendly with lots of social events for students. Most of the students I have talked to here really love it. It is an amazingly beautiful campus compared to UAA, though it is more isolated and we don't have a hockey team! The administrative staff (student records and registration etc.) will bend over backwards for you here, as opposed to Anchorage which seemed to have a lot more long lines and red tape. I have visited the University of Alaska, Fairbanks a number of times and like that campus as well. It is the only "research" campus in the UA system, but I wouldn't personally want to go there. Too cold! 18. Do you get that bored, small town feeling in Alaska? Hmmm, well, what part of "Alaska"...once again, the state is huge and incredibly diverse. I never get bored in Juneau. I'll be honest; I hated it when I first moved here though. I was all alone, I moved here in August, start of the rainy season in a year they had record rainfall. I didn't know anyone, I've struggled with depression on top of that, however, that only lasted the first year or two and it always takes me awhile to adjust to a new local. Now I'd never leave. I bought a house in adorable downtown Douglas and I'm here to stay. I met my soon-to-be-hubby (who grew up here) because we both had Catalina 22s on the same float in the Douglas Harbor. There is a fairly active sailing community here with races most weekends during the summer. There is a very active arts scene here too, we have the Juneau Symphony, Alaska's premiere professional theatre company, the Alaska Folk Festival, a top notch city owned ski resort, hockey, fishing, boating, kayaking, hiking, and we have our own brewery, a brand new Aquatic Park with slides, a large lap pool, beautiful public libraries, and more. There is always something going on, and after you meet people, a lot of dinner parties and bon fires on the beach and I don't know, downtown Juneau looks like a mini (very very very mini) San Francisco. Plus there is the University of Alaska Southeast here, which means things like lectures to go to, opportunities to take outdoor classes, etc. The main draw back I can think of is the high level of precipitation. Some people don't mind it at all, it was hard on me at first but now, when we have a week of 80-degree days I start longing for the cool, misty overcast days. And in the winter it is *much* milder than a lot of states in the lower 48. Very few, if any, days below zero with average temps around 30 degrees. If you are considering moving to Anchorage, well, it's a bigger city so there are just as many things to do there, except for the water sports. There is a beautiful ski resort in Girdwood, about a 30 minute drive from downtown Anchorage. Also there is a huge water park, the Alaska Zoo, the Anchorage Museum of History and Art, the Alaska Center for the Performing Arts, University of Alaska Anchorage, lots of libraries, and much much more. However, Anchorage is more spread out, and not as charming in my opinion. There are some neighborhoods with a lot of character though. The one thing I *really* miss about living in Anchorage is the trail system within the city. The Tony Knowles Coastal Trail is absolutely fantastic. 19. Is it true there is surfing in Alaska? As far as surfing goes...there isn't any traditional surfing in the Juneau area that I'm aware of though there is surfing in other parts of Alaska, including Kodiak and closer to Juneau, there is surfing in Yakutat. Juneau is inland, lots of straights and channels which doesn't make for good (any) waves. We do get wind, and I've seen wind surfers and para-skiers out in the channel from time to time wearing dry suits but that's pretty die hard and would be very cold for someone from warmer areas. 20. What else is there to do in the Juneau area? There are lots of cool things to do here. Good (and cheap) downhill skiing in the winter , amazing hiking, an indoor rock climbing park, there is a skate park but I'm know it's *nothing* compared to the ones I remember in Oceanside. Still, better than nothing. The University has a recreation facility. You can take the UAS campus virtual tour if you want to check out the campus. 21. I am still single, is there a good dating scene in Alaska? I would say that in most cities in Alaska, the male to female ratio is about even so the tales of 10 men to every woman have been greatly exaggerated. There are parts of the state where I'm sure these numbers might exist, but none that I've been to. One bumber sticker I used to see a lot when I first moved to Anchorage was "Alaska, the odds are good but the goods are odd!) LOL! The start of this section used to read: "I'm not the one to ask this question as I don't date for personal reasons." However, in Summer of 2006 I met and fell in love with a true Alaskan outdoorsman and got married in July 2008! So there ya go! My sister lives in Anchorage and she met and married a great guy and they have an adorable child together. Most of my friends have married people they met here. There are plenty of ways to meet people by getting involved in areas that you're interested in but people here use match.com as well. A good friend of mine is dating a guy she met that way and things seem to be going great. I suppose your age will make a difference too. In Juneau, as elsewhere in the state, there are lots of younger seasonal workers who flock here during the summer for jobs in tourism or fishing so the downtown bar scene (as small as it is here in Juneau) is really hopping then as compared to the winter months. I still hear a lot of bitching about how hard it is to meet people but I hear that from all of my single friends who live anywhere in the world so I don't think it's a problem specific to Alaska. The key lies within you, and how much you want to get out there and meet people! 22. I've heard of the mosquitoes in Alaska, what other bugs do you have? I'm not sure what kinds of bugs we have here. I've seen spiders, I don't think we have any that are poisonous though. I don't think there are any cockroaches, I've never seen any here anyway. There might be ants though again, I've never seen them. There are bees but no killer bees. There are worms, lots of slugs in Southeast Alaska. There aren't any cockroaches...and not an insect but there are no snakes here either. I've lived in warmer climates (Hawaii, Southern Spain, Mexico) and next to them, Alaska is practically bug free. Oh, and the mosquitoes here aren't as bad as you've heard. Anywhere along the coast the breezes keep them away, they only get *really* bad in areas with a lot of stagnant water...I have had a few horrible mosquito incidences while out camping, but it's not the nightmare you'll often read about. 23. Is Alaska more dangerous than the lower 48? Are things like wildlife, earthquakes, avalanches, volcanoes, etc. a real concern? Depending on where you live, there are various aspects of life in Alaska that are more dangerous than other parts of the United States. For example, there are a lot more hazardous jobs here, in industries like logging, oil exploration, and especially commercial fishing. Alaska is on the Ring of Fire so in parts of the state there is lots of seismic activity. There are earthquakes (and volcanoes) frequently in the Anchorage area, though not so much here in Juneau. There are lots of forest fires in the Interior of the state, near Fairbanks but less so in Southeast Alaska (because we're a rainforest and get more precipitation). Because of all the extra rainfall Southeast Alaska is at greater risk for mudslides. Avalanches are a concern in most parts of Alaska that have mountains (the Interior is relatively flat). Every year people die from avalanches but the majority of those people are snow machiners who participate in "high marking" where they see how high up the side of the mountain the can climb to mark their height. Also, it is a danger for backcountry skiers/boarders. My husband's brother (a ski instructor) was tragically killed in an avalanche. 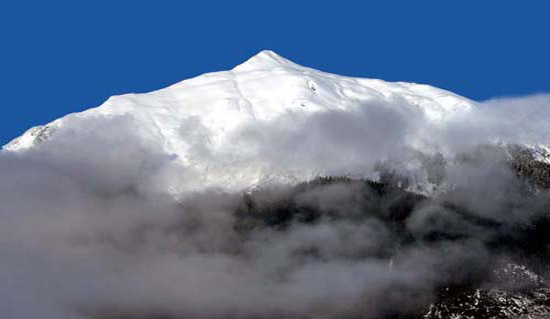 Juneau is in path of several avalanche shutes but they are monitored daily and there is an urban avalanche advisory site. An avalanchetook out our entire city's hydro-power several years ago, which took months to restore. There are a lot of wild animals in Alaska, but few attacks. There was a man trampled to death by a moose at the University of Alaska Anchorage when I was going to school there and in today's Anchorage Daily New I read: "An Anchorage woman walking along the Dalton Highway was chased down and bitten twice by a wolf Friday morning in what wildlife officials are calling a "very rare," but not unprecedented, attack." I personally have been on multiple backcountry skiing trips, as well as hiking, rock climbing, fishing, etc. all over the state and I've never been threatened except once when a friend's dog chased a bear cup up a tree...no one was injured. There are also "bear ordinances" in most Alaskan communities, laws about how you dispose of your trash (you need locking bear-proof containers). I laughed out loud when my dad was visiting and took a trash bag out and sat in on the curb. Major fine waiting to happen! You aren't even supposed to put seeds in bird feeders because it attracts bears...but in bear vs. human encounters within the city limits, it's usually the bear that gets the short end of the stick. I personally find Eagles a bit scary. They have been known to fly away with small cats and dogs so if you bring fluffy with you to Alaska, best to keep her indoors! On another note, because of some hardships in the state, such as the lack of light (which gets worse the farther north you go) leads to depression, alcoholism, and domestic abuse. The crime rate in Juneau is not high however. I have never felt unsafe due to crime (I did a few times when I lived in Anchorage but that's a much bigger city). You never hear of car jackings, rapes, or drive bys in Juneau. So, overall I don't think that Alaska is that much worse than anything else and your risks increase dramatically based on factors that are for the most part in your control. 24. What stores are there? Like malls, clothing stores, craft shops, wine and beer making supply stores, and supermarkets? I love to shop and was wondering about the difference in stores? In Juneau we don't have that many big name stores but we have a lot of nice, small, locally owned stores. For groceries I like Superbear or Alaskan and Proud which sells things like greek olives, prosciutto, fresh baked french bread, expensive cheeses etc. plus, finding good wine is not a problem....oh, and Gourmet Alaska	does sell home brewing supplies... we also have a Safe Way and our Fred Myers recently got our first Starbucks coffee	shop. Big Box Type Stores: We have Costco, Home Depot, and WalMart but we don't have: Sam's Club, K-Mart, Circut City, Best Buys, Toys-R-Us, Nordstroms, Target, Old Navy, Pier One, Office Depot, Best Buys, Barnes and Noble, or Borders. Fast Food: We have McDonalds, Subway, and Dominos. We don't have KFC, Pizza Hut, Arbys, Wendys, Burger King, Taco Bell, Quiznos, Karls Jr., White Castle, etc. We also don't have Olive Garden, Benihana's, TGI Fridays, or any of those types of places. Oh, and we have two painfully small malls with stores like Radio Shack and JoAnne's Fabric and several good outdoor clothing shops but that's about it. Anchorage, on the other hand, is a larger city and has nearly all of the above mentioned stores. I find that the majority of people in Juneau buy things locally from small mom and pop stores when available or else they buy online. A lot of places won't ship to Alaska but some places, like amazon.com, will honor free-shipping offers even to Alaska, and when items are shipped through USPS shipping isn't much more than in the lower 48. Also, most Alaskans try to get "Outside" a couple of times a year and shopping is always high on the agenda. 25. I have a small short-haired dog. Would he be all right in Alaska, or would the environment be too harsh for him? He is always inside when I am home, but I do leave him out in the back yard when I'm at work. There is a W I D E margin of temps in Alaska. On the same day Barrow could be as bad as -50 °F while it could be 35 °F in Juneau, so it will depend on what part of Alaska you move to, and the time of the year. In Southeast Alaska there are probably only a few weeks during the worst part of winter where it's too cold to leave a short-haired dog outside, but in Anchorage or Fairbanks, I think it probably gets too cold for that type of dog on a regular basis during the winter. 26. I am interested in immigrating to Alaska. Could you tell me what steps I need to take to get started? Alaska is a part of the United States of America. It is a complex process and one that I can't address sufficiently in this site so here's a link to United States Immigration Support. Good luck! 27. Is it true that if you move into a remote area of Alaska, build a log cabin and live there for a year, the government will give you that piece of land? What you're referring to is homesteading. The short answer is that it isn't really done here anymore. When i first moved up here they used to have land lotteries that were similar to what you're referring to. you could buy a chance to win a remote piece of land and then you had to "homestead" it, though the requirements were not the same as actual homesteading. 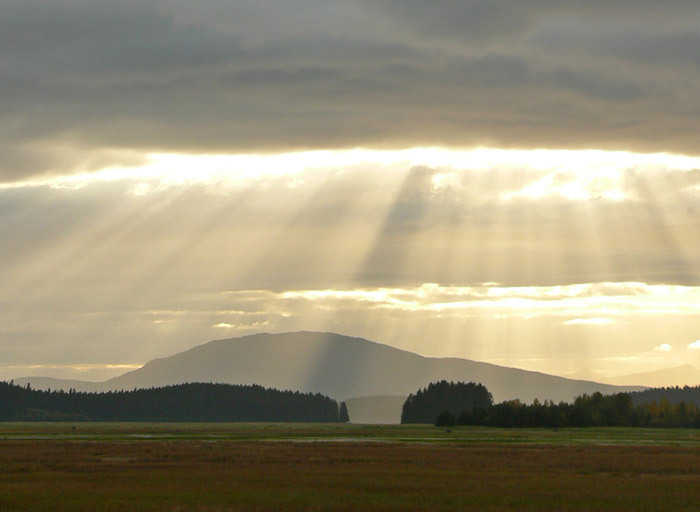 I'm including a link to an FAQ about Alaska State Lands Availability which should answer all of your questions. 28. If you have more questions you'd like answered by a real life Alaskan, consider asking a librarian! Depending on what part of the state you want to move to, you may consider looking for a library in that community Most library websites have an "Ask the Librarian" link. I am friends with librarians all over the state and they are the greatest, most helpful group of people ever. If you ask them questions though, try to make them specific and not too personal. I never made that qualifier in the past but then several of us got questions at our Reference Desk from a guy who kept asking "how do you like living in Juneau?" but didn't have anything in particular he wanted to know yet didn't want to get off the phone with us and called back repeatedly, it made some of the librarians uncomfortable. So, for example, if you're interested in living in Homer Alaska, asking a reference librarian in Homer questions like "How much snow do you get in the winter?" or "Is there a lot of crime?" or "Are there many bear encounters?" etc. instead of asking over and over again how they personally "feel" about the town or saying "just tell me anything you can think of about Homer"...which is much harder to answer from a reference perspective. Still, for the most part librarians will do their best to answer you or research the answers if necessary. It might be a good way for you to have one on one conversations with people who actually live where you're considering moving. 29. Hey, just wondering, is there a gay scene in AK? Are most Alaskans tolerant of homosexuality? As far as the LGBT scene in Alaska, it really depends on where in Alaska you are considering moving to. Juneau's LGBT community seems active at times and not active at others, but Juneau in general is a more liberal environment than many communities in Alaska and there are a lot of LGBT people who live here and I know that PFLAG is active here. I know the university where I work has LGBT resources on campus (my office is a "Safe Zone"). I personally have many gay, lesbian, and bi friends here in Juneau and it doesn't seem to be much of an issue. I don't know any trans-gendered people here but I don't think that would be a problem for most people in Juneau either, I just don't happen to know any personally. The same goes for Anchorage, which is a bigger city and therefore probably has a bigger community. Check out Gay and Lesbian Community Center of Anchorage, Identity, Inc. Anyway, perhaps someone at the Identity center in Anchorage could answer your questions with more details. I hope this has been somewhat helpful. Good luck to you! 30. My question is about diversity. I am an African American woman, and from what research I've done, about 1% of the population in Juneau is African American. I was wondering if you knew if the black people in Juneau are well received, if there are any issues? I just got off the phone with an African American who recently moved to Juneau. I thought that he might have more insight on how black people are received in Juneau than I would. He said that although he's made some wonderful white friends here, one thing that has surprised him is how African Americans have treated him as a new person in Juneau. He said that even though the population is very small, he doesn't feel that they have particularly reached out to him. He says that other than on campus, the only black people he sees are in Walmart and Fred Myer, and that the proverbial "head nod" of recognition does not happen here. That when he has done that, he's received questioning looks, like "do I know you?". He said that there isn't a true black church in Juneau, but the Breakthrough Church (on Mall Road) does have a large black congregation and that is one place to make connections if you're a church goer. I asked if he felt any discrimination in housing when he was looking around and he wasn't really sure. He wanted to rent first and there were quite a few people who never called him back or only returned his calls weeks later, but he moved here right in the middle of tourism season when demand (due to seasonal hires) is high, so maybe race was a factor or maybe not. One other thing he mentioned is the lack of black hair care products in Juneau, so plan to bring a lot of hair care products with you and tons of moisturizer, as the climate is dry (despite being a deciduous rain forest). Also, it rains a lot here which is really bad for perms but there are a couple of beautician's in Juneau that he thinks are good. You can buy stuff online but shipping can be more than the price of the item. Amazon.com is one of the few stores that honors free shipping even to Juneau! Anyway, that's all I can really remember from my conversation with him. Good luck with your decision to move to Juneau.